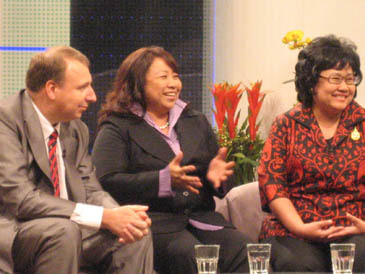 Philippines Tourism Director and Attache Mrs. Maricon Basco-Ebron (center) expounds on Tourism Philippines during the Arirang TV talk show on May 3..
Arirang TV hosted Philippines Tourism Director Mrs. Maricon Basco-Ebron on its talk show "Arirang Cafe" which went on air May 3, 2008. Amongst the topics discussed were tourism norms, travel statistics and how South Korea can increase its amount of visitors. Mrs. Basco-Ebron's tourism expertise was called on to bear on live television to give South Koreans insights on the secrets of her country's success. Arirang TV is an international, English-language network based in Seoul. Other invited guests included tourism representative of Thailand and France. One of the first issues discussed was why more people aren't visiting South Korea. Last year 13 million Koreans left the land of the morning calm to travel abroad. The number of people coming here is less than half that at 6.3 million. So why is it that these two numbers are so disproportional? "South Korea has a lot to offer travelers" noted the tourism director. "South Korea's food though expensive is exquisite, it has unique cultural sights, and beautiful mountains. However, getting around South Korea can be difficult due to the language barrier. All signs should also be in English to make the country more foreigner friendly," she said. Arirang Cafe is one of the network's most popular and longest-running shows along with "Showbiz Extra," "Pops in Seoul" and "Heart to Heart." Through the talk show "Arirang Cafe," viewers can gain diverse insights and perspectives on Korea, glimpsing the country through the eyes of foreign diplomats, visiting international newsmakers and more. While South Korea is making efforts to make it more "international" there are still a few things missing. Making it easier for travelers to make their way around should, in her opinion, take precedence. Another important aspect is creating closer ties with each other. As both countries visit each other in greater numbers, so should their cooperation. The Philippines and South Korea should increase what Mrs. Basco-Ebron calls "reciprocal promotion efforts." "They are a great way to create mutual gains in the tourism industry and tourism officials and media representatives would be exchanged to experience the attractions of both countries,”Mrs.Ebron said. This will also further develop better understanding of each other's culture. The future of tourism for the Philippines looks bright and stands to grow steadily. Last year, the Philippines reached its target market in terms of bringing in South Koreans as it attracted over 654,000. Goals can't be reached without apt leadership and the Philippines has recently enjoyed such. The dynamic and visionary leadership of Tourism Secretary Joseph Ace Durano is behind a large part of the phenomenal growth of the tourism industry in the Philippines in the past three years. With so many variables going in its favor, it's easy to see why it's steadily on its way to becoming a competitor with its South Eastern neighbor, Thailand who had over a million South Korean arrivals last year. However, the Department of Tourism has a slow but steady policy in terms of tourism development. "We are not ready for big arrivals yet, and we don't have the carrying capacity for bigger volume of arrivals" said Mrs. Basco-Ebron. We only have 13,000 rooms in Manila as compared to the 55,000 of Bangkok alone, exclaimed Mrs. Basco-Ebron. "The government is now focusing on developing the infrastructure, especially in terms of building more ACCESS roads to new destinations, starting more resorts and seeking private investment" she answered when asked about what the Philippines was doing to prepare to compete with Thailand. Filipinos are visiting South Korea in ever growing numbers. One of their favorite destinations is the island of Jeju Do. "The island of Jeju is so popular with my people that Philippines airlines now fly directly there" said the department of tourism director. Part of the allure of Jeju-Do is due to the famous South Korean soap opera Daejanggeum or Jewel in the Palace as it is called in English. Television shows like this and others like it are quite popular in the Philippines. As cooperation continues, both countries stand to gain. South Korea remains the Philippines target market and with that comes the promise of a future of mutually beneficial ties. Founded in 1996, Arirang TV airs news, cultural programs, educational shows, documentaries 24 hours a day, in more than 188 countries. As Korea's premier English-language channel, Arirang's mission is to present an accurate view of Korea to the world through unbiased news reports and programs featuring a diversity of perspectives. Viewers with little knowledge about Korea or with an outdated impression of the country can gauge the pulse of the fast-changing nation through Arirang.